This Garden Room is 3.4 x 8.4m in size, which is a bespoke size that allows the building to fit into the customer’s chosen space in their garden in Corsham, Wiltshire. The customer intends on using their building as a large outdoor living area for their family to enjoy the views of their garden from. Due to the size and rectangular shape of this Garden Room, the customer has got the standard set of double doors on one end of the front elevation, with three sets of double windows next to them, and then, to add another access route, they chose to have another single door positioned on the right gable on the opposite side. 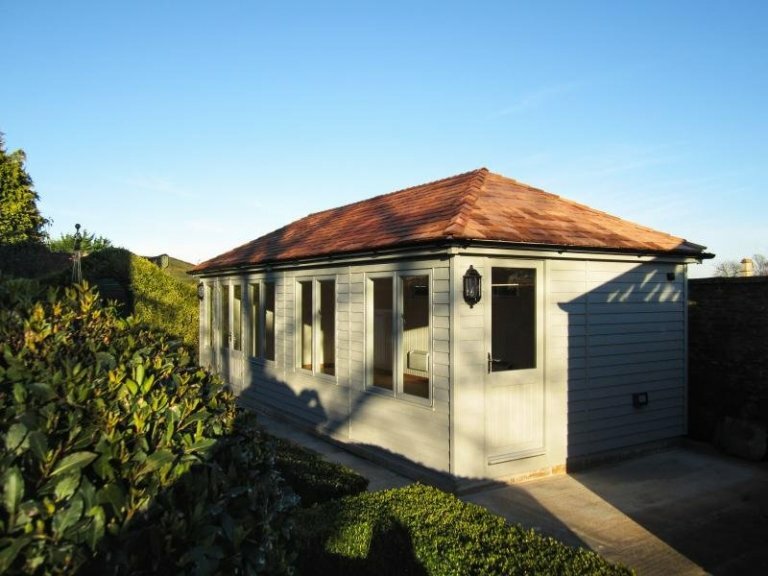 Cedar shingle tiles have been used on the roof, along with black guttering to help catch excess rainfall, and the paint colour the customer chose for their Garden Room is Pebble, which is a neutral colour from our Valtti Paint Range. Internally, there is full insulation, painted matchboard lining, heavy duty flooring, an electric pack with two heaters, and all the windows are double glazed. There are also two fanlight windows high up on the back wall to allow for extra ventilation. 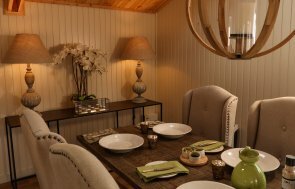 Due to the features of this Garden Room, it is perfectly suited to year-round use. 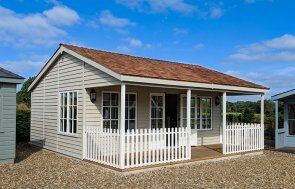 If you would like to know more about our Garden Rooms, or even our Summerhouses or Garden Studios, please call us on 01760 444229, or come and see our range of garden buildings on display at any of our Show Centres across the country.